Khenpo Palden Sherab (Tib. མཁན་པོ་དཔལ་ལྡན་ཤེས་རབ་, Wyl. mkhan po dpal ldan shes rab) (May 10, 1942 - June 19, 2010) was a senior khenpo of the Nyingma tradition. He was born in Gyuphu in the Doshul region of East Tibet. He entered Riwoche Monastery at the age of 12 and completed his studies there just before the Chinese invasion. In exile, in 1967, he was appointed by Kyabje Dudjom Rinpoche as the head of the Nyingmapa department at the recently formed Central Institute of Higher Tibetan Studies at Sarnath. 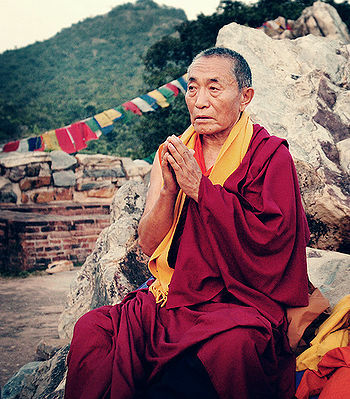 He taught in America and throughout the world together with this brother, Khenpo Tsewang Dongyal. This page was last edited on 20 November 2017, at 22:01.